Es ist Montag, und das heißt wieder Monkey See, Monkey Do. Dieses Mal habe ich mir für meine Nail Art folgendes Vorbild ausgesucht! Am Ende kann ich sagen, ich habs zumindest versucht. 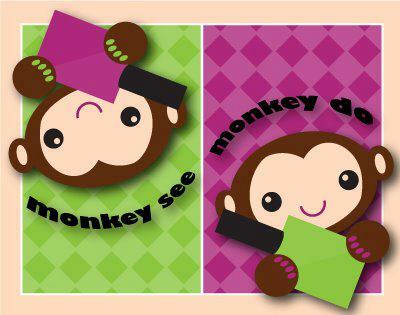 Today is Monday and we all know what that means, it's monkey see, monkey do. For my mani, I want to do a rainbow gradient with white stamping, as seen on this blog. Well, at least I can say, I tried! First, I applied one coat of P2 Base+Care followed by one coat of Chillout #03, I love love love this colour! For the gradient I used the Chillout polish, Manhattan 21G, Essie Coat Azure and a sponge and you can see parts of it on my ringfinger and pinky, not the best one to use for a gradient Manicure. Finished with one coat Essence BTGN Top Sealer. For the stamping I used Bundle Monster BM 19 and Essence Stampy Polish in white and finished with one coat of Essence Nail Art Top Sealer. And as you can see, I had to use the plate twice on my middle finger, the designs from the first Bundle Monster set are way to small.